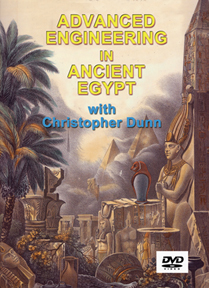 In this DVD filmed at the 2009 Ancient Science Conference, Dunn presents a stunning stone-by-stone analysis of key Egyptian monuments, including the statue of Ramses II at Luxor and the fallen crowns that lay at its feet. His modern-day engineering expertise provides a unique view into the sophisticated technology used to create these famous monuments in prehistoric times. Using modern digital photography, computer-aided design software, and metrology instruments, Dunn exposes the extreme precision of these monuments and the type of advanced manufacturing expertise necessary to produce them. His examination of the mysterious underground tunnels of the Serapeum illuminates the finest examples of precision engineering on the planet. Providing never-before-seen evidence, Dunn’s research shows that while absent from the archaeological record, highly refined tools, techniques, and even mega-machines must have been used in ancient Egypt. Extras. All our DVDs are Valid in All Regions and All Countries!